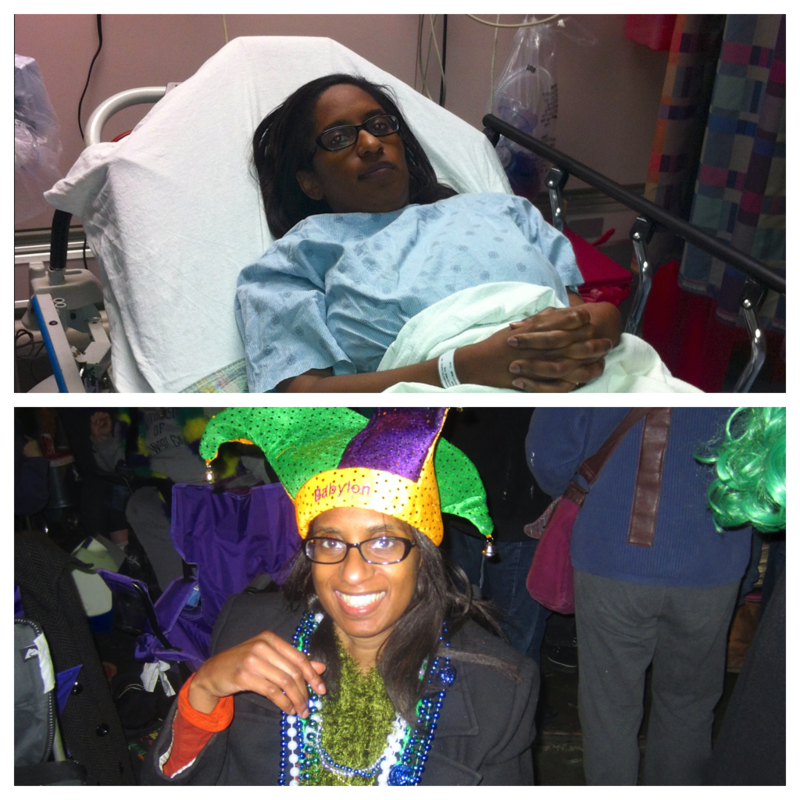 Last week I was in the hospital for two days after having an adverse reaction to my latest prescription. The symptoms were so bad that the doctors first thought I had a stroke. It wasn’t until all of my test came back negative that we linked my sudden change in health to the new medication. Before this happened, I was excited because it is Carnival time. 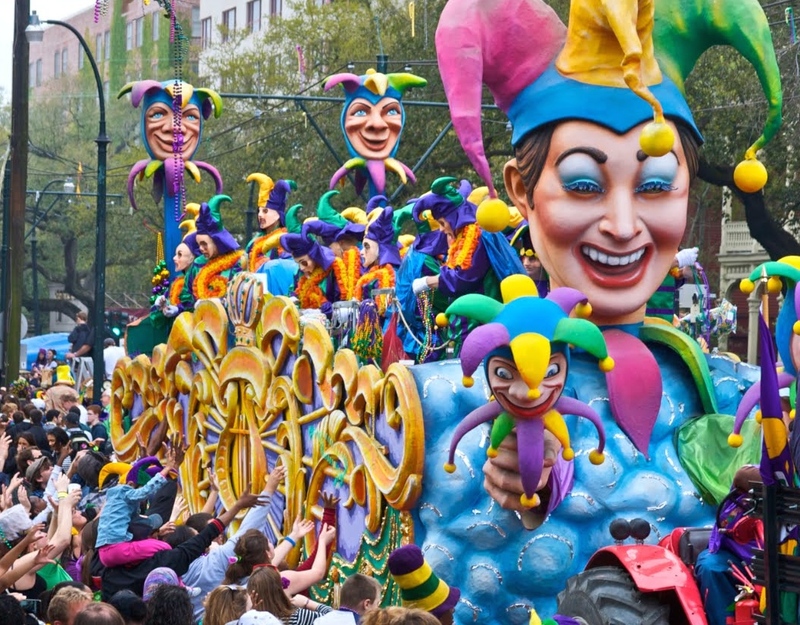 I have been going to Mardi Gras parades in New Orleans, Louisiana for over 30 years. But this year just wasn’t the same. I can’t put my finger on it but I didn’t have as much fun as usual. My guess is, since I really hate being in a wheelchair, being at a parade in a wheelchair just wasn’t enjoyable. I don’t like when people stand in front of me blocking my view. It’s funny because everyone is nice until the floats start throwing trinkets. Then it’s every man for himself. Also, bladder issues can cause a real headache especially since the portable restrooms provided by the city are not wheelchair accessible. But my best guess at the source of my newfound melancholy feelings toward attending parades is the fact that I have been extremely tired lately. I am so weak these days that it’s hard to enjoy myself at events, especially ones that take so much energy. Parade days are all-day affairs that can last 5 hours or more. And there are usually multiple parades. 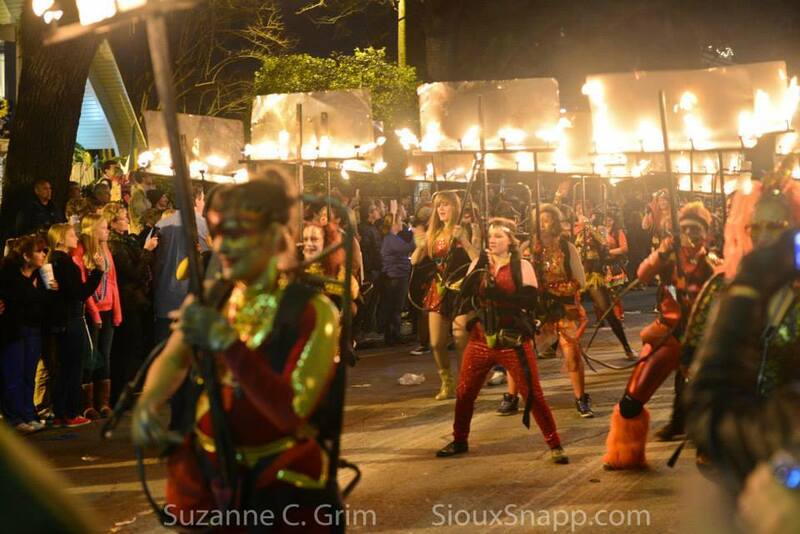 The recent one I attended was actually three different parades. This is something I did all the time, but nowadays it’s just too much for me. And being only one day removed from the hospital didn’t help either. 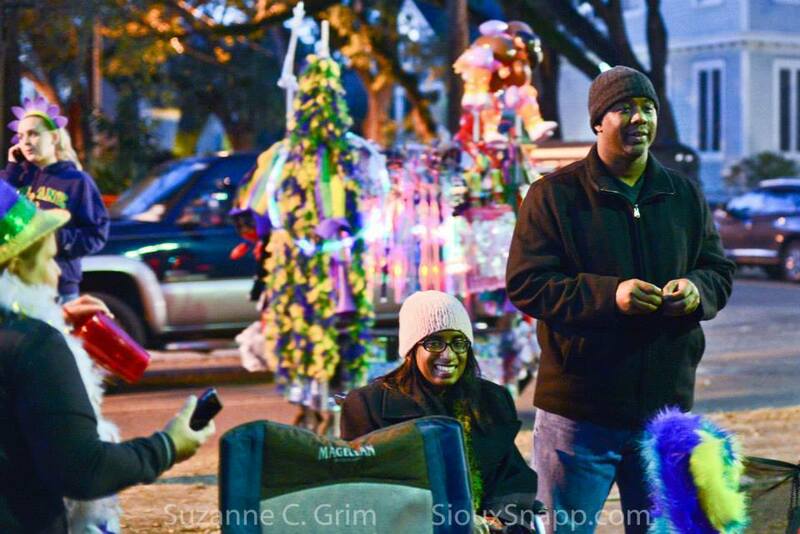 After I made it home from the parades, I decided I would not attend anymore because they are just too taxing on me. 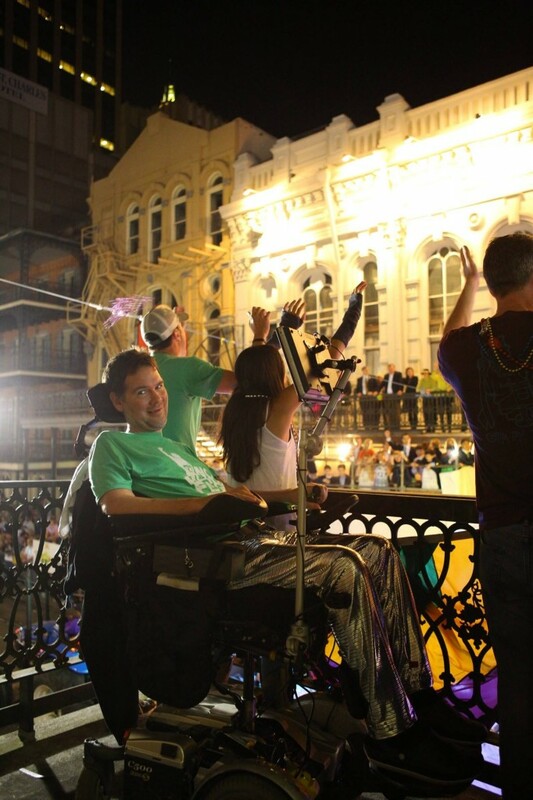 Moments later, following my declaration, I saw a picture posted by Steve Gleason* at a Mardi Gras parade. He helped me put my overreaction into perspective. So now I have decided that I won’t totally stop attending Mardi Gras parades. I’ll just adjust how long and how many I attend. Glad you made it to the parade even if the conditions were not ideal. I haven’t been to a parade since I’ve been wheelchair bound, except a dinky one a couple blocks from my house that I went to alone. My husband has no interest in parades (or much else). He’s the only one who could potentially take me to such an event. Friends have tried to learn to operate my wheelchair lift, but unsuccessfully. No one even offers to try and take me out any more. Here in Hawaii they usually do have a handicap accessible PortaPotty at public events. I have used them and they really are great – easy to negotiate and a whole lot cleaner than the others because they get used less. Laurie, I never thought about handicap accessible porta pottys. I figured they didn’t have them. Laissez les bons temps rouler, oui? (I think, may be wrong sp ? and I just thought of the play on words on the way lots of us have to get around…) Oh, Nicole, you are wayy beyond awesome! I am so sorry about the new med reaction, but am thrilled beyond expression that you went to Mardi Gras. You know, I have wonderful old friends who have gone every single year for forty years and have invited me time and time again and, of course, I have always been too afraid to go (crowds, claustrophobia, fatigue, catheters…). HOWEVER, because of you (and Tim! ), this old gal is going to make the effort to get to Mardi Gras 2015! Thank you, as always, for your keen perspectives and incredible perseverance. Sue, I will just for you guys! Thanks again for all you do and keeping it real! As one person already commented, MS should not determine what we do, just how we do it! You are so resilient and sorry to hear about your recent set back. Unfortunately most of your readers can relate to the fatigued tired feeling which can be a huge challenge in and of itself. Whatever you do just keep moving, never give up, and keep it real! So sorry about the medication reaction. Sounds like a doozy. As for Mardi Gras, I’ve never attended, but even with your restricted view, you made it real. Just discovered your blog. I have had ms for 27 years. I am wheelchair bound. Your blog is very encouraging to me and echo many of my thoughts and experiences. I have forwarded some things to friends who have responded with great interest since all have challenges, not necessarily ms, for which your words have struck a chord. Ann A p.s. do you use Dragon to type on your computer? Ann, I’m so happy you found me! Where do you live maybe we can stay in touch. I release new posts on Tuesdays.Thanks for reading and keep moving! nicole–I live in Crested (FREEZING!) Butte, CO–check out 81224 weather–i am from dallas so this is NOT my cup of tea! I’d love to talk to you and give you my # but i don’t want to post it for ALL to see…if you send me an email i will happily exchange numbers! thx, ann a. Happy Mardi Gras! I am not in a wheelchair, but do have issues with my balance, bladder and suffer from heat intolerance . This makes enjoying the parades more of a challenge, but my five year old loves parades. We get a parade package from Zea’s on St. Charles and then I can sit inside and watch the parades if I get hot or tired and can easily get to the bathroom. It might be worth looking into. I will definitely be doing it again next year. Shelley, I’m glad to hear you say that ! Congratulations Nicole! I too have had to learn not to let MS affect WHAT I do, just HOW I do them….Keep on moving on – great experience…thank you so much for sharing it! Linda, Thanks for the support. I’m moving! Sue, I figure you would stay in today. the weather is horrible. When I first read where you said you would not attend any future Mardi Gras, I knew that was a temporary thought/feeling and you proved me correct. Yes, you will continue to go as long as you are able to attend, because that’s who you are. A fighter!!!! MS may knock you down, but it won’t keep you down. Thank-you for your blog. April, thanks for the support and encouragement. it goes a long way. 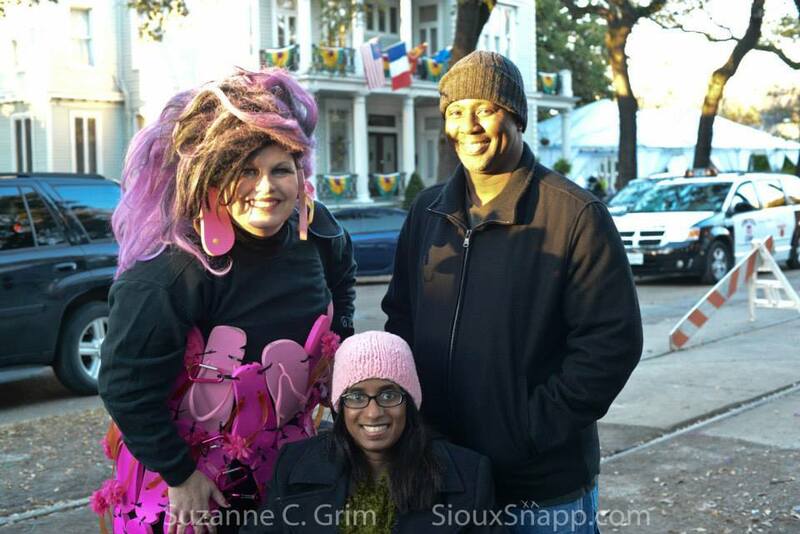 Amy, Mardi Gras is a blast! you go to join us one day.